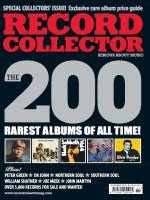 The November 2008 issue (#355) of the British magazine Record Collector presents the Top 200 of the most valuable albums of all time produced in the UK. As one might expect, a large number of the positions are taken by British artists, although some albums by Elvis Presley made the list. The most expensive collectible item according the writers: The Beatles by The Beatles (1968) that can go as high as € 9000 if you own one of numbers 1-10 of the first 10,000 numbered albums issued; 1,001-10,000 go for € 750. Released in 1984, this box was one of the first CD releases in the UK. RCA released the box in a numbered limited run of 5,000 with certificate and special booklet. Very high for a (1969) re-release, but apparently it is quite rare in the UK. This LP is the most expensive Elvis item on vinyl in the UK. While there were many copies of this album sold, it is nearly impossible to find a record in mint condition. I have not seen a complete list of the Top 200; if anyone has the complete list, or knows where it is posted on line, please let me know, and I'll provide a link.